A unique chance to explore some of the best walks on both Harris and Lewis, plus an optional day trip to the World Heritage Site of St. Kilda. Plus £225 for optional St. Kilda day trip. A wonderful start to the holiday on this ancient route where we will traverse South Harris twice in one day! This is a day of tremendous contrasts, starting on the intricate, rocky shores of the Bays of Harris before following part of the new Outer Hebrides Way long distance path over to the spectacular sandy beaches amd turquoise seas of Seilebost on the island's west coast. On the second full day of the holiday we will be off (weather permitting!) 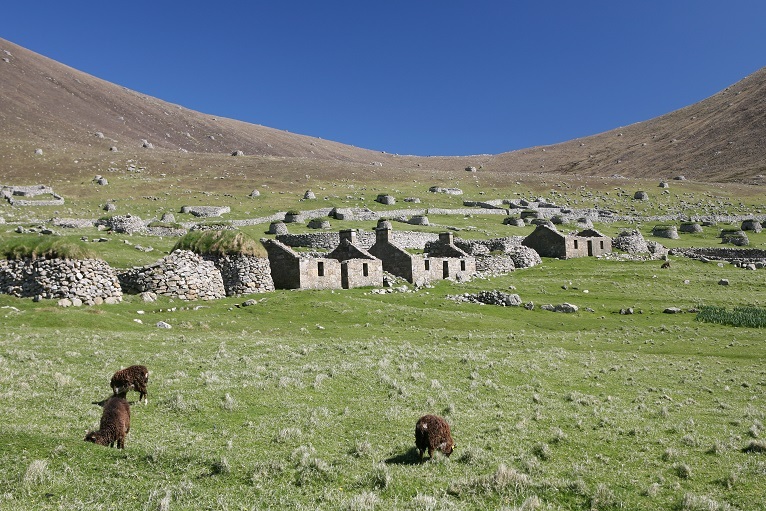 on a sensational day trip by boat to the remote island archipelago of St. Kilda. These famous islands are Britain's only dual World Heritage Site, nominated for both their outstanding cultural and archaeological remains and their sensational sea bird colonies. A visit to St. Kilda really is an awe-inspiring and unforgettable experience. Thousands of gannets soar above you as the boat approaches the sensational rocky spires of its three main islands - Boreray, Soay and Hiort. Once ashore, the ruins of the old township on Hiort are an astonishing sight, and the wildlife and archaeology make for a truly fascinating day trip. If you prefer not to take the boat trip to St. Kilda we will take you on an additional hike on either Lewis or Harris. A spectacular end to the tour, with this wonderful and varied low level hike - one of the best in Scotland. Starting at the beautiful machair of Huisinish, we will visit the stunning beach of Traigh Mheillin, which provides unparalleled views out to the nearby island of Scarp. From here we will explore the beautiful Glen Cravadale, before returning back to our start either (if the weather is kind) over the small but imposing Huisneabhal Mor or (if it isn't) along an ancient hill track to Amhuinnsuidhe Castle. What's Included: 6 nights accommodation in comfortable island guest houses*, 5 days walking. All meals (except lunch on the final day), including full Scottish or continental breakfasts, packed lunches and evening meals. All transport during the holiday, boat trip to St . Kilda (if this option is selected), and the services of a experienced guide. St. Kilda: If you wish to go on the St. Kilda day trip you must commit to this when you book your holiday. The boat operators can only take a maximum of 12 people per trip so it is important to book early if you want to secure your place. There is an additional charge of £220 per person for the St. Kilda trip. Please note that the deposit for this holiday is non-refundable as we have to pay a non-refundable deposit to the boat operators for the St. Kilda trip. If the St. Kilda day trip is cancelled due to bad weather then your £220 payment will, of course, be refunded. * We will be staying in comfortable guest houses in or near Stornoway on the Isle of Lewis, the bustling little capital of the Outer Hebrides. All rooms will have ensuite or private bathrooms. Single occupancy rooms are available at an additional cost of £120. Grade: Moderate. This holiday goes at a gentle pace, with plenty of time to stop, take pictures, soak up the atmosphere and watch the wildlife. However, it is still a walking holiday, so you will need to be able to cope with a reasonable amount of hiking each day. As a guide, you should be able to manage small uphill sections, be comfortable walking for 5 hours and 7 - 10 miles or so each day, and be confident walking away from paths - for example over rough, grassy hillsides. We try to keep to easy ground as much as possible on these walks, but there will be some areas where the going can be a little rough and quite wet underfoot, so good hiking boots are essential. We don't tackle any hills on these walks but there are usually some modest uphill sections each day. On Hiorta, the main island of St. Kilda, we will be doing a climb of approximately 280m (900ft) on a rough surfaced road. This is steep but relatively straightforward and provides great views of the village and the neighbouring island of Soay. If you do not like the idea of the climb you are welcome to spend the time ashore exploring the fascinating remains of the old village. For more information about how we grade our holidays please refer to our Grading Information page. .The following reviews are taken from the Hidden Hebrides page on TripAdvisor: For reviews of our other holidays click here. This walking tour was the highlight of our trip to Scotland. We loved our fellow walkers and our guide, Emma, who knew es on a Croft in Harris. They got this right, from the small group size, to the pace of the day, the accommodations in Stornoway, the meals at night and the scenic walks. I can’t oraise this experience enough, and hope to return one day to do another part of the islands.